In earlier times, coal miners took canaries into the mines to tell the condition of the mine’s atmosphere. They knew that if the fragile birds could live, the air would support human life. If the birds fell dead, it was time for the miners to rapidly climb to the surface. The honey bee has been described as our present-day canary in the coal mine. Its decline and death means that the environment is becoming less safe for humans. The monarch butterfly is another species that is an indicator of the health of the environment. The beautiful monarch is well known for its 3000 mile annual migration across North America to Mexico. Alarmingly, the migrating butterflies have been reduced to a severe minimum with monarchs declining in numbers by 90 percent in recent years. Many of the suspected causes of the monarch butterfly’s decline are the same as those involved in the decline in honey bees: the loss of habitat and food, the effects of climate destabilization, and heavy use of pesticides and herbicides. The developing monarch butterfly caterpillar relies on a single food source, native milkweed. Adult monarchs consume nectar from flowers for energy for their migration. Much of the land that supported the monarch butterflies has been converted to agricultural usage, primarily to grow soybeans and corn. A New York Times article, http://www.nytimes.com/2013/12/21/us/setting-the-table-for-a-fluttering-comeback-with-milkweed.html, relates efforts to provide necessary food for the monarchs. Individuals, businesses, and government agencies are being encouraged to plant milkweed and create monarch waystations for the butterflies. Fortunately, creating habitats and feeding areas is quite simple, and the benefits extend to honey bees and other important pollinators. Information on habitat restoration is available through the Pollinator Partnership, http://www.pollinator.org/monarchs.htm, and Monarch Watch, http://www.monarchwatch.org/. The prospects for restoring monarch populations are promising. According to Monarch Watch’s director, Dr. Chip Taylor, butterfly populations can vary wildly from year to year as habitat and weather change. 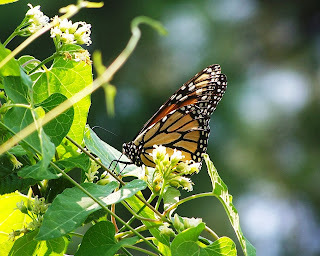 In today’s photo a monarch butterfly forages on milkweed at Peace Bee Farm. This year brought me the opportunity to once again travel to Africa to share ideas with the beekeeper farmers of Ethiopia. I am thankful for the hospitality of the Ethiopian people and of the support of my family who took care of Peace Bee Farm in my absence. 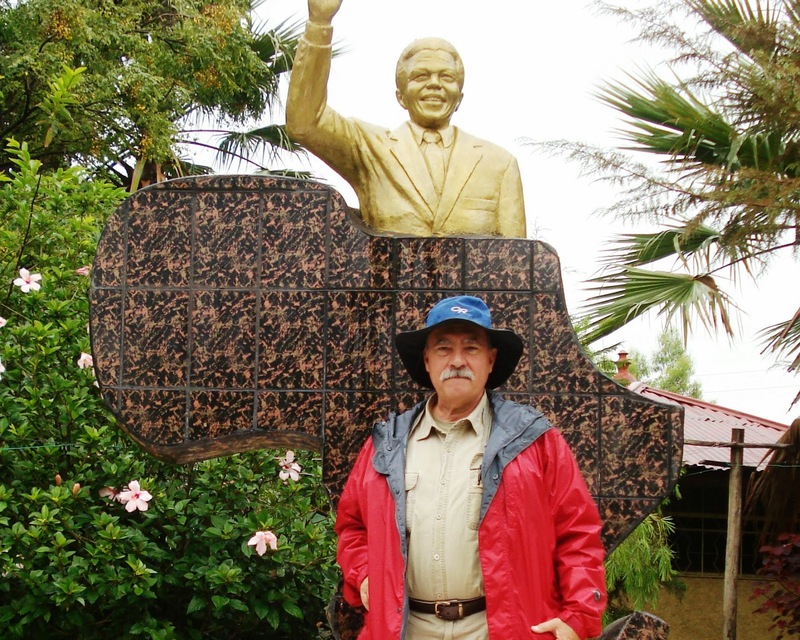 I want to acknowledge some of the others who are working to train beekeepers in Africa. Megan Wannarka is a Peace Corps volunteer working daily with beekeepers in Senegal. Stephen Petersen, Cesar Flores, and Ed Levi are Winrock International volunteers working in diverse regions of Ethiopia. Their expertise helped identify bee colony problems which should lead to healthier bees and increased incomes for the Ethiopian farmers. Daniel Kocha and Gemechis Jaleta are thorough in making training arrangements in Ethiopia, and they are both extremely knowledgeable of the needs and resources of the Ethiopian farmers. Johnnie Frueauff handled my travel arrangements with great care. My driver in Addis Ababa, Kassahun Wegayehu, was always friendly and ready to travel, night or day. My host in Ethiopia’s Amhara Region, Behailu Alemayehu, effectively handled the translation from English to Amharic. Driver Daniel safely negotiated the Blue Nile Gorge. I offer my best wishes to Selamawit Abebe, Demke, Teshome, Abeba, Fantahun, Abisu, Sefinew, Haimanot, Getenet Yitayew, Ketemau Melkamu, Tarekegn Wondimagegn, Melkamu Bezabih, Haile Dembosa, and Firewu. I offer my great thanks to Ato Gebeyehu who graciously took me into his home and shared his beekeeping experience with me. In my beekeeping training assignment I was treated with kindness by the people of Debre Markos, Embulie, Yewbush, Amanuel Town, the Machakel District, and Dembecha, West Gonder. In today’s photo, I am dwarfed, literally, by the statue of Nelson Mandela at the gallery of renowned Ethiopian artist Lemma Guya. Nelson Mandela passed away December 5 of this year. On behalf of the Underhill family that operates Peace Bee Farm, I offer to all who observe the great religions, traditions, and philosophies of the world: Peace be with you.